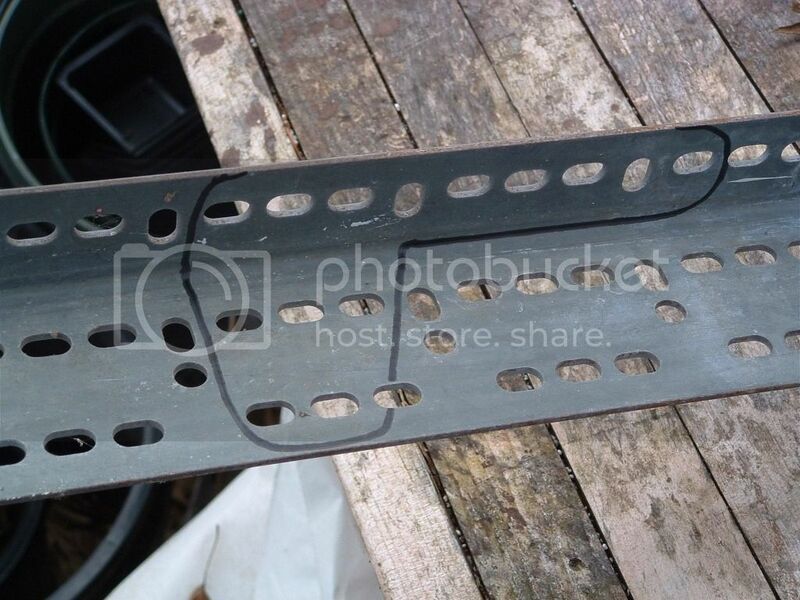 Does anyone have a photo or photos of the bracket for their driving lamps? Looks like a bar or tube that runs under the nose of the fairing then the lights mount on the ends. 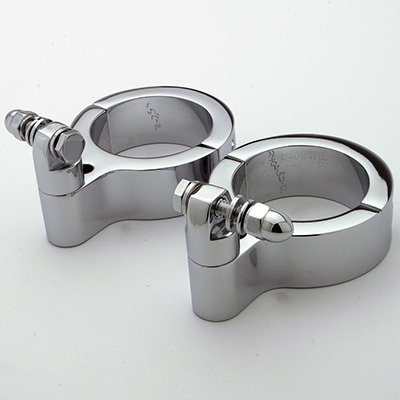 Just purchased a set PIAA 5370's but I need to figure out how the mounting system is designed. Thank You All I will post detailed picks during the surgery. You mean like a Buck Sport Touring light bar? I had my brackets custom made as I was running PIAA 910 lamos and they are rather large. They'd likely be overkill for most anything else. 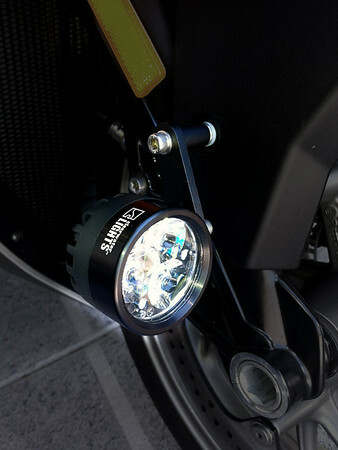 I believe Snarf also makes fairing-mount brackets that look like they would handle many of the smaller lights available these days. Thank You Guys, but I am to cheap to spend a $100.00 on something I could fab up from $20.00 worth of hardware. Hence a photo of the mounting itself, I will be back in the shop Saturday to install my PIAA 530 lamps and do some repairs. I will post pictures of the project for future reference. If I recall correctly, Larry uses the fairing mount up and behind the headlight with brackets that run down to the crossbar. I have never seen one in person however. Don't know how big the PIAAs are but my Denali D1s are mounting on the lower forks where the brake line bracket guide is. Basically remove the guide and bolt in the bracket. 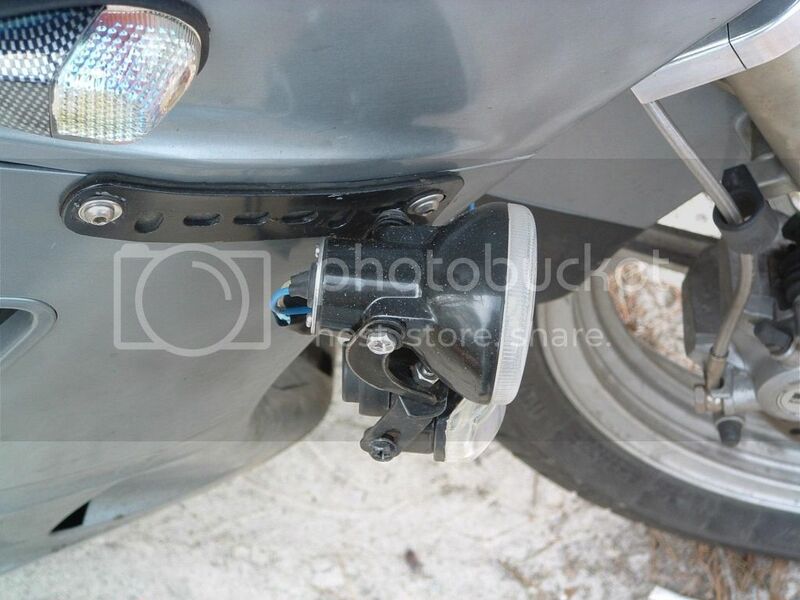 Mounting them there allows the light to turn with the front wheel while allowing the main head lamp to project forward. The Denali's are small LEDs but project a lot of light and so far I have not had any issues with their mounting location. How about those photos of the install of the new lights? I'm still looking for a good mount for my led's. I don't know weather to mount them to the forks or the fairing now. I should have my new lights mounted by the end of the weekend with the mounts pictured below. I'll let you know how it goes. I'll be documenting the install with plenty of photos. Sounds great, let us know how it turns out. I'd be very interested! Mr Orange, where exactly are you mounting those? Fork tubes?? 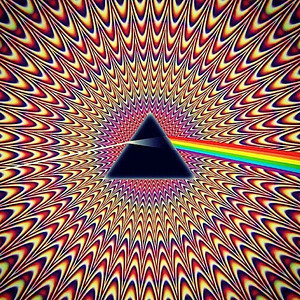 Ok McFly, I feel like I need to jump in here. First I already posted some photos and I said I'm doing the install this weekend. So right now it pretty difficult to post photos of something that hasn't occurred yet. 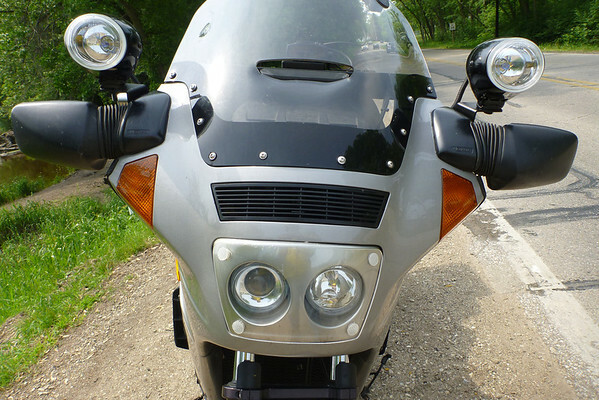 I have my driving lights (PIAA 910s) mounted high on the fairing. Are these the mounts you are talking about? I know there used to be one that mounted in front of the oil cooler. Is that the one you are referring too? The bar on the blue bike is still available. and the way to make 'em... I'm thinkin' I may give it shot down the road. The lights on Elvin's bike are Hella FF-200's mounted on my mount. Some of the finest driving lights ever. Unfortunately, Hella no longer makes them. Next best from Hella are the FF-50's. They are reasonable priced, but you will have to make up your own wiring from the materials furnished by Hella. The switch is not suitable for our use because it is not weather proof. You will need a "bug switch" for this. Some FF-200's can still be found, Google around for them. If you find them (driving version - not fog) get them. You won't be sorry. I'm assuming you are talking about these? As far as I'm aware, no one else makes them. The plans from Guy to make them out of angle iron used to be on the web somewhere, and that's how Snarf got the original design. I believe I got one of the very last sets Snarf made about a year ago. He's had a lot of long work days and family issues, as well as a crash last year that have kept him unavailable to continue his machining hobby. Page created in 0.689 seconds with 26 queries.